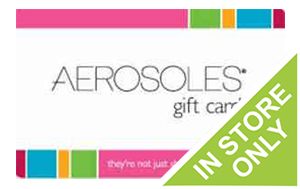 If you love comfortable, stylish shoes at reasonable prices, then a discounted Aerosoles gift card is for you! Why pay more money than necessary for great shoes? Finally, you can have comfortable, fashionable shoes for every season, and pay less for them! Living on a budget can be challenging, luckily, a discounted Aerosoles gift card saves money on stylish, comfortable shoes! And with departments in heels, flats, sandals, boots, and sport casual, there is something for every lady. Shop online and receive free shipping on orders of $75.00+ or visit one of over 88 worldwide retail locations for a shopping experience you’re sure to love! Buy a discounted Aerosoles gift card today and save money on your entire purchase. Enjoy super comfortable shoes with specially designed soles for absorbing shock- all in the greatest new fashions- for less money out of your wallet! What’s more, because gift cards are a form of currency, you can use coupons and store promotions as well! With Cards2Cash on your side, you can look your very best and spend less! When you buy a discounted Aerosoles gift card from Cards2Cash, you will save more money than ever have before on comfortable shoes you’re sure to love! But that’s not all! Cards2Cash offers a variety of discounted gift cards for everything from department stores to pet shops. For more money savings, be sure to check out our listings for Ann Taylor, Saks Fifth Avenue, Neiman Marcus, and more! With Cards2Cash, looking gorgeous while staying within your budget is easy! Do you have an Aerosoles gift card you aren’t going to use? Turn your unwanted gift card into money! We pay top dollar for unwanted gift cards for lots of retailers! From restaurants, drug stores, and pet shops, we can save you money every day! If interested, stop in one of our retail locations for on-the-spot payment for your unwanted card OR fill out our simple online form, and we’ll make you an offer you’re sure to love! Whether you buy a gift card from Cards2Cash or sell us one, we have you covered!